There is an occasional segment on The Late Show with David Letterman called: “Will It Float?” As the name suggests, the skit involves tossing an unusual object into a pool of water to see whether it sinks or floats. The participants engage in extensive speculation about the fate of the object before the toss. Then, with great fanfare, the object is hurled into the water. In the episode I saw, the object sank. The parallels to new associates arriving on the scene at a large law firm were inescapable. My first lesson in client service came via speakerphone. I was brand new at the firm, and my modest office was next door to the cavernous corner office of a senior partner. He had a habit of keeping his door open and counseling clients in a thunderous voice on the speakerphone. He could do what he wanted. But for a merger, his name would still have been on the wall in the lobby. A divorce client had called. She had changed her mind and wanted the refrigerator. It’s late. It’s dark out. You are working alone in the office with another colleague. Something clicks. Hold your horses cowboys and cowgirls; little good will come from an office romance. This particular path to bliss is fraught with peril. 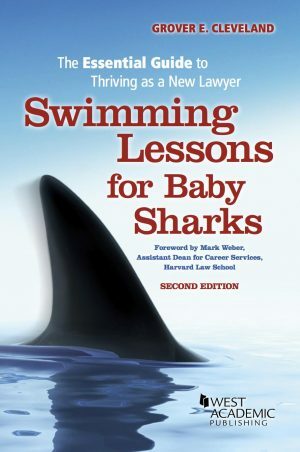 Grover E. Cleveland, author of Swimming Lessons for Baby Sharks: The Essential Guide to Thriving as a New Lawyer, provides informative and engaging seminars and presentations to help law students and recent graduates become better lawyers faster.